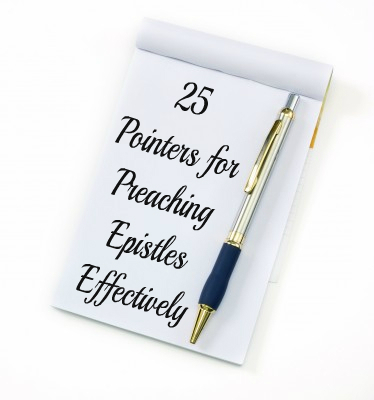 Continuing the list of pointers for preaching epistles effectively, since they aren’t the automatically easy genre to preach well! 11. Preach, don’t commentate – Don’t offer your listeners either a running commentary or a labelled outline of the text. Make your points relevant to today, put them in today language, then show that from the “back then” as you explain the text. Don’t preach “back then” and then offer token relevance once people are disconnected and distracted. 12. Describe vividly, engage listener with letter – If you can do a good job of painting the original situation, the emotions of the writer, the potential responses of the recipients, etc., that is, if you can make it seem full colour, 3-D and real, then your listeners will engage not only with you, but with the letter. Suddenly it won’t seem like a repository of theological statements, but a living letter that captures their imagination and stirs their hearts. The theological truth will hit home when it is felt in the form God inspired! 14. Keep imperatives in their setting – Some of us have a tendency to use an imperative magnet. We cast our eyes over the text until we spot a command, and bingo! Now we think we have something to preach. We don’t. Not until we get a real sense of how the whole passage is working. It doesn’t take much skill to turn every epistle into a command collection. Certainly don’t avoid the instructions, but don’t ignore everything else too. 15. Tune your ear to the tone of the writer – This is so important. Some tone deaf preachers make every instruction, implication, suggestion, encouragement or exhortation into a shouted command. I think Paul and company would look on with consternation if they heard how their letters were preached by some. Be sensitive to the writer’s tone and develop sensitivity in your own tone. Tomorrow we’ll touch on another, well, five, of course. Add your own by comment at any time – the list is not intended to be exhaustive!